One of the best-kept secrets in the recording industry is BACK and M1 is ready to share it with the world. Spectra 1964 was an integral part of many classic recordings. Their op-amps and EQs were utilized in the consoles of some of the most legendary studios in the world. Over the past 45+ years, their Model 610 compressor has found a devout following, including the likes of Tchad Blake, Dave Cobb, Vance Powell and many more. Spectra 1964 has offered the world's finest hand-built audio equipment since 1964 and we still adhere to the same rigorous standards. Spectra is considered "vintage" now, but really it's the forefront of modern recording technology! The Spectra Legacy was acquired by a partnership of two former employees in 2007. The same manufacturing techniques which were implemented by Spectra under its original ownership are still used today. All Spectra equipment is hand-tested and hand-soldered in our Ogden, Utah facility, by a small team of specialists. All Spectra equipment undergoes rigorous hands on testing before leaving the factory. Much of the testing equipment used was hand built in the original factory over 40 years ago. Our factory specifications have not changed. You can rest assured that your brand new Spectra equipment will sound just as good as your favorite vintage unit. It's funny because I always love old records. There something with the Beatles, the Stones, Waylon Jennings. Whatever it is, I always love the sound of old records, and I love the sound of everybody in one room together. It's very seldom that records are made that way anymore. Hey, I'm Dave Cobb. We're at historic RCA Studios in Nashville, Tennessee. Damn, this business, it's such a long journey. I figured I needed to go to California, so I went to LA for about 11 years. I wound up producing a country record kinda by accident, this guy Shooter Jennings, and the record did pretty good. That led to working with Jamey Johnson, and I kept taking trips to Nashville and eventually I made my way here. I don't think there's anywhere else in the world that art meets commerce like Nashville. There's more bands, there's more incredible musicians, there's more going on than any place I've ever lived. My heaven is being around a bunch of kinda common minded people that wanna experiment and change and do things. This is the right place for me now. I have been in this studio a few times before. We did Chris Stapleton Traveller in this room. We had about three weeks booked, I think, but we probably finished the record in about half of that time, but we just goofed off in here and really enjoyed ourself. That's when it started to feel like home. The gear is super important cause it inspires me to come in and play around with something new and get excited. I think that excitement translates to the room, the other players, the singer. Mastering is a lot more than just making the songs louder. Fortunately, I get to work with a lot of clients that aren't necessarily concerned with the volume, they just want the record to sound as good a possible. I got in to the audio industry basically through necessity. I've been playing in bands since I was 16 years old and eventually needed a way to record these bands and eventually that led me in to becoming more interested in the mastering portion. Some of our recent clients include Chris Stapleton, Jason Isbell, Fallout Boy, Weezer. We do a lot of different types of music. Everything from country and Americana to heavy rock and pop music so we're preparing all the different delivery formats we do, digital, CD, master for iTunes and vinyl. My signal chain is primarily analogue. I do use a few plugins, mostly digital limiting. There's a few digital EQ's I will use to kind of clean up the signal either on the front end or the back end, but primarily all mastering gradient analogue gear and I added the Spectra Sonics limiters about 8 months ago and they haven't left my chain since. I've used them on every record I've done this year and they've been invaluable. Coming up in the recording world, I got to be around a few Spectra Sonic consoles and hear their mic pres and hear the just legendary stories of records that were recorded on these amazing consoles. When I first got them I was a little unsure. I have to admit, I didn't quite understand how they worked. Typically I'm not a guy that likes to sit around and read manuals so I just put the piece of gear in the chain and that's when I learned about he peak limiting function on these comp limiters. Once I discovered how to use these things as a peak limiter, it changed my life and they changed the way that I master. In 1969, Spectra unveiled the Model 610 Complimiter, a revolutionary audio compressor and limiter. At the heart of the Model 610 was the 601 Compressor/Limiter module. This module allowed users to employ The Model 610’s compressor and limiter circuitry independently or simultaneously. Its low noise floor, ultra-fast peak limiting and intelligent compression earned the 610 its status as a classic studio compressor that is used by some of the best-known engineers in the industry. The Spectra 1964 Model V610 Complimiter can be considered an evolution of the original Model 610, utilizing the very same 601 module with updates to fit in 21st Century workflows that include tracking, mixing and mastering. With amplifier stages based around the low-noise 110A amplifier circuit, the V610 is capable of 65dB of gain and +24dBu, making it a deft mic preamp in addition to its Complimiter functions. In mastering applications, the V610 has detented/switched controls for precise recall of all parameters. The ultra-fast, fixed-timing peak limiter circuit operates fully within a 180 nanosecond range, transparently eliminating voltage transients without applying compression and effectively increasing the headroom of any device placed after the V610 in the signal chain. The compressor circuit has a fixed attack around 100 nanoseconds, and variable release timing from 50 milliseconds to 10 seconds with full bandwidth at ratios from 1.1:1 up to 100:1, making it capable of both extremely transparent compression and hard compression. For tracking and mixing, the V610 can be used to do anything from subtle, automatic gain control, to invisible peak limiting for safeguarding analog-to-digital converters, or to dial in aggressive, fast-release, compression to add color to your sonic palette. Though the heart of the Model V610 was designed nearly 50 years ago, its brilliant design still has specifications that go unrivaled in today’s industry, proving Spectra Sonics founder William G. Dilley was decades ahead of his time. And now, a new generation of engineers is discovering the Spectra Sonics sound for themselves. In 1969, Spectra 1964 unveiled the Model 610 Complimiter, a revolutionary audio compressor and limiter. Unique to this design was its ability to peak limit and compress audio separately. At the heart of the Model 610 were the 601 Compressor/Limiter module and 101 amplifier circuits. The Model 610’s low noise floor, ultra-fast peak limiting and intelligent compression response made it an incredibly versatile unit and earned its status as a classic studio compressor. For decades the Model 610 could be found safeguarding levels to tape, strapped across the mix bus, and even before record lathes in some of the most well known recording studios in the world. With the fastest peak limiter in the world and a compression attack time around 100 nanoseconds, the Model 610 Complimiter was the first device of this type to eliminate compression pumping and the need for de-essing, while maintaining full bandwidth at ratios of up to 100:1. 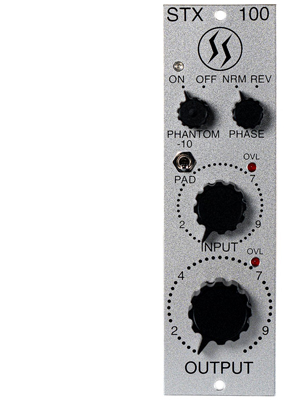 In addition, the 610 is one of the few, if not the only device of this type, that rivals the best microphone preamps in terms of noise and distortion. Combined with an input threshold of -40dBu, the 610 offers the user the best of all worlds; peak-free transients, adjustable compression, low noise and distortion, and considerable amplifier gain. Nearly 50 years after its release, the Model 610 still has specifications that go unrivaled in today’s industry, proving Spectra Sonics founder William G. Dilley was decades ahead of his time. And now, a new generation of engineers is discovering the Spectra Sonics sound for themselves. “Spectra Sonics introduces the Model 610 “COMPLIMITER,” the newest proven concept in a rack-mounting compressor/limiter system with performance both measurably and audibly discernable as “beyond state of the art.” This unit performs the functions of peak-limiting and volume-compression, either independently or simultaneously, as a direct function of the type of program input, with performance that is unequaled by most linear amplifiers. The extremely low noise characteristics of this unique, self-contained system provide a very low threshold of -40dBm, thus allowing the greatest input sensitivity and compatibility with audio equipment and accessories used in the professional recording, broadcasting, motion picture and sound-reinforcement industries. As the fastest of all peak-limiting devices (100 nanoseconds to 2 microseconds), peak-limiting can be employed with no audible distortion of any kind, thus allowing undistorted recordings, transmissions, etc. at average levels significantly higher than conventional “0” VU (+4dBm or +8dBm) while simultaneously providing maximum amplitude protections. A white threshold indicating lamp provides the audio engineer – for the first time – a representation of the peak-limiting taking place without the task of monitoring an auxiliary oscilloscope. A separate red overload indicating lamp forewarns the operator, in advance of overload, exactly when to check his control adjustments without requiring his undivided attention. The continuously variable compression/limiting ratio assures the widest range of slope control available from 1.1:1 (approximately linear amplification) to approximately 100:1 (flat slope, maximum amplitude protection line). Coupled with a constant threshold attack level of -40dBm, the need to continuously reset input levels during operation for each new compression/limiting ratio is eliminated. Variable release time control allows the selection of the smoothest dynamic action commensurate with minimum distortion (typically less than 5/100ths of 1%). The uniform frequency response of this unit negates the need for “de-ess” roll-off on all high frequencies. Every once in a while, an idea comes along that just works. An idea that makes so much sense that it's hard to understand why nobody else did it before. Enter the Spectra 1964 Model 611 Complimiter. Spectra Sonics is known for their proprietary Complimiter circuit. The Spectra 1964 Complimiter circuit features the fastest analog peak-limiter in the world. For decades engineers have used this circuit to "invisibly" remove transient peaks from their tracks. Removing even inaudible transient peaks improves the headroom and performance of equipment downstream of the Complimiter. Now imagine applying this principal at the start of your recording chain BEFORE peaks can cause any performance issues. 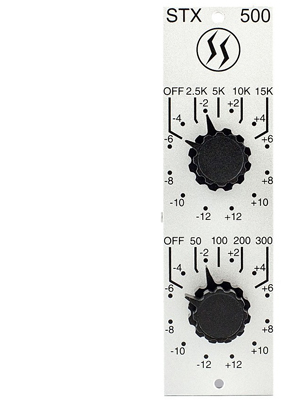 The Spectra 1964 Model 611 Complimiter is a hand-built, discrete design utilizing custom transformer I/O that accepts a balanced line input, microphone input, or high-impedance ¼" input and is designed to be placed in FRONT of the mic preamp in your signal chain, thereby eliminating transient peaks as close to the source as possible. Removing peaks before the preamp allows the preamp to more accurately reproduce the source before the recording device. The STX 100 is a 500 Series version of the classic Spectra 1964 101 amplifier circuit. The STX 100 is a high-bandwidth microphone preamp with 64dB of gain and a 10Hz to 50KHz frequency response. A 10dB input pad and a dual potentiometer offers continuously variable input pad and output level controls allow the STX 100 to be used with both microphone and line level sources. To complete the classic Spectra Sonics console channel configuration, the STX 100 has integrated connections for inserting the STX 500 2-Band Passive Equalizer module.